خورش بادمجان Traditional Iranian lamb and eggplant stew with yellow split peas and tomatoes is a rich and flavorful dish and one of the favorites among many Iranians. 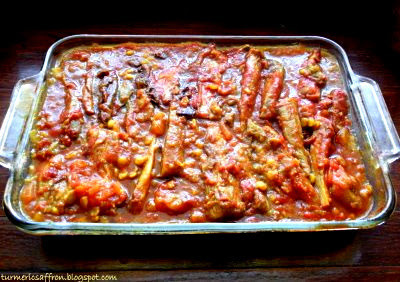 I love the classic combination of velvety eggplant and tomatoes with tender lamb cubes in a tangy delicious tomato sauce with yellow split peas. Place the salted eggplant in a large container filled with water, place a heavy bowl or a heavy lid on top of the eggplant to hold them down for ten minutes, this will get rid of the bitterness. Remove eggplant, pat them dry make sure eggplants are dry before frying. Heat 1/2 cup of oil in a large skillet over medium-high heat, fry eggplant slices in until brown on both sides. Remove from oil and place on a paper towel to remove excess oil. Gently place tomatoes in a pot of boiling water for about a minute or two, remove tomatoes from boiling water, place into a bowl of ice water and let them cool off. Peel the skin and chop the tomatoes. In a large saucepan, heat 3 tablespoons oil over medium-high heat, add chopped onions, saute until translucent, add minced garlic, stir and cook for about two minutes. Add turmeric powder, lamb cubes, salt, pepper. Mix thoroughly. Cook until meat is brown on all sides. Add chopped tomatoes, tomato sauce and water to cover all the ingredients by an inch. Bring back to a boil, lower the heat, cover and cook for 40 minutes on medium heat. Add yellow split peas, fried eggplant and dried lime. Add a little more water if needed. Cover and cook for another 20 minutes or until meat is tender. Add the lime juice or verjuice and 1/4 teaspoon cinnamon, gently stir, cover and simmer for another 15 minutes on low heat, allowing all the flavors to come together. Serve hot with rice, fresh herbs, salad shirazi, torshi, or mast o khiar. * I've tweaked this recipe a little bit and added the cinnamon toward the end of the cooking process. 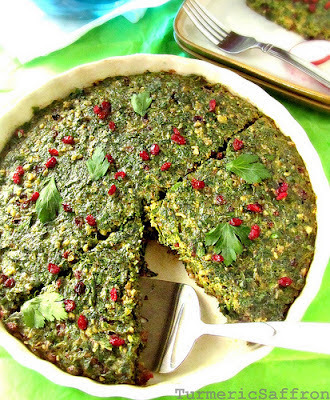 کوکوسبزی Kookoo sabzi is a fresh herb dish served for lunch/dinner during Nowruz (Persian New Year). This dish is a great one-pan vegetarian meal made of several fresh herbs and just enough eggs to hold it all together. If you bake it in the oven rather than frying it on the stove it absorbs less oil, which is always a good thing for the health conscious cook! Once you have all the vegetables cleaned and chopped, the rest is very easy. Add all the chopped herbs, barberries, walnuts, turmeric, flour, baking powder, red pepper, salt and pepper, mix until combined. Add two tablespoons of oil to the mixture, stir well. 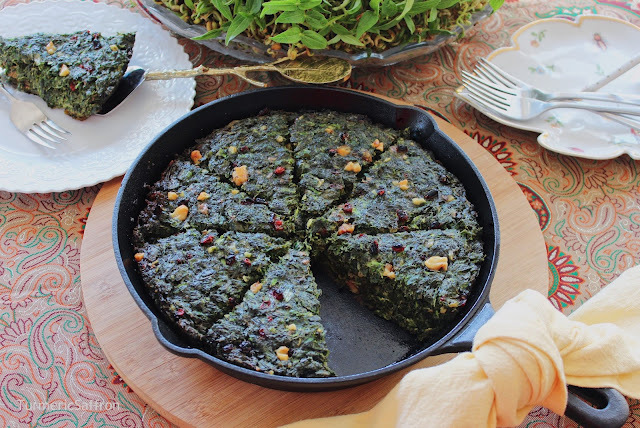 Gently pour the herb mixture into a well-oiled baking dish, smooth the surface and place in a 350 degree Fahrenheit preheated oven for about 30 minutes or until the center feels firm. Remove from the oven and allow to cool before cutting into serving-size pieces. Place on a serving platter. Kookoo could be served hot or room temperature with warm bread and mast o khiar and torshi (pickles). سبزی پلو با ماهی Sabzi polow (herbed rice) and crispy pan fried mahi (fish) is one of the main traditional meals for Nowruz - Persian New Year. There's only few weeks left before Nowruz and I'm all ready for the cold winter to be over. The weather is still very cold, the grass is brown and there are no blossoms on the trees. However, yesterday I made Sabzi polow - herbe rice with fried fish. These are traditionally served on New Year's day. Clean, wash, dry and finely chop the herbs and mix them together in a large bowl. It’s better to use fresh herbs for this dish; however there is always the dried sabzi polow herb mix that you can find in Iranian grocery stores. Wash the rice with cool water a few times. Soak in 8 cups of water, add 4 tablespoons of salt and set aside for a couple of hours. In a large non-stick pan, bring 3 quarts of water to a rapid boil. Drain the rice and add to the pot. Bring water to back to a boil for about 5-7 minutes. Test to see if the rice is ready. Rice should be firm in the center and soft on the outside. Strain the rice using a colander and rinse with cool water. Wash and dry the pot and return to heat, add 4 tablespoons of vegetable oil and a few drops of liquid saffron. With a large spatula place the rice into the pot, place a layer of rice and a layer of vegetables building it into a pyramid shape. Place the peeled garlic cloves in between rice. Make 4 holes in the rice with the bottom of the spatula to release the steam. Cover and cook for 7-10 minutes on medium-high heat until rice is steaming. Pour 2 tablespoons of oil and 2-3 tablespoons of water over the rice, lower the heat, cover and steam the rice for 50 minutes on medium-low heat.With a large scoop take some rice from the top, mix in with the dissolved saffron and set aside. Serve rice on a platter; sprinkle the mixture of rice and saffron on top. Season fish on both sides, lightly coat the fillet with flour and shake off any excess flour. Heat 3 tablespoons of vegetable oil in a skillet over medium heat, place fish in the pan and fry until golden brown and crispy on both sides. Place the fried fish on a serving platter, squeeze lime juice over the fillets. 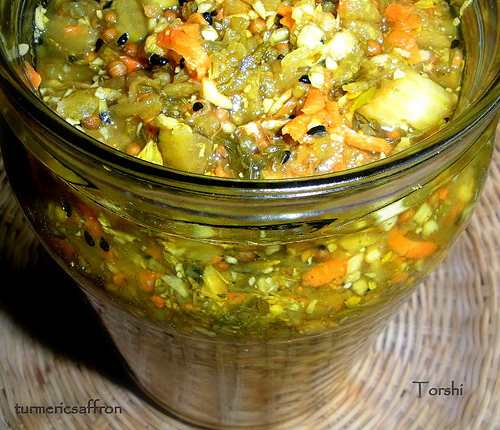 Serve sabzi polow and mahi with fresh herbs, salad and pickles (torshi).